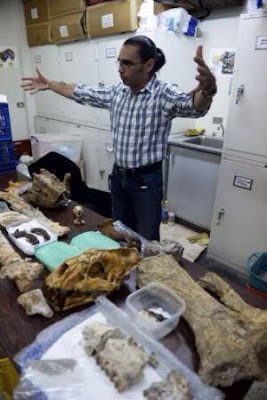 The Laboratory of Paleontology at Venezuela's Institute for Scientific Research is filled with fossils recently found in oil deposits concentrated in a large area north of the Orinoco River. The crowded tables and drawers include the remains of an oversized featherless chicken, a 10' (3 m) pelican, giant sloths, a 6-ton mastodon, a car-sized armadillo and a bus-sized crocodile, and a new species of saber-toothed tiger (IMAGES HERE). The trove of 12,000 specimens discovered so far range in dates from 14,000 to 370 million years old. "Imagine a puzzle of 5,000 pieces and you have 200 pieces you are trying to interpret and draw a conclusion that might contribute something to science," says overwhelmed paleontologist Ascanio Rincon (IMAGE ABOVE).